Temporomandibular joint (TMJ) disorder can be the cause of numerous chronic aches and pains. For instance, because your jaw function relies on these joints, it’s common for patients with TMJ disorder to have trouble biting and chewing without their jaw joints popping or shifting painfully. For many patients in North Hollywood, TMJ disorder can also be the cause of symptoms that aren’t obviously related to their dental health. That includes chronic headaches and migraines that result from the constant stress on your jaw joints and nerves. The problem with TMJ disorder is that it can mean something different for everyone. In some cases, one or both of your jaw’s joints may be excessively inflamed or damaged. In others, the joints can lose their full range of motion due to traumatic injury or rheumatoid arthritis. In most common cases, it results from a bite imbalance that forces the joints to work overtime just to keep your jaw and teeth even. This excessive strain can damage one or both joints or irritate them enough to disrupt their proper function. 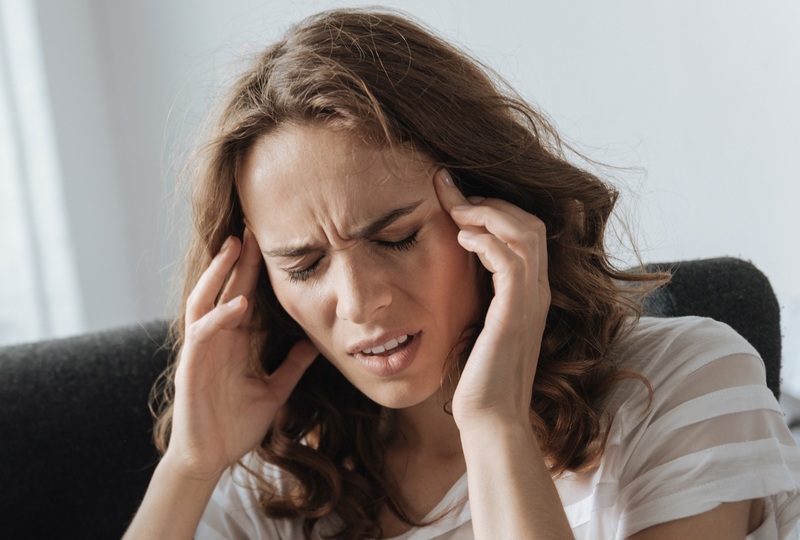 If you suffer from chronic headaches and migraines, then ask us if TMJ disorder may be the cause behind them. For more information, schedule a consultation by calling Modern Smile in North Hollywood, CA, today at 818-763-9353. We also proudly serve patients who live in Burbank, Toluca Lake, and all surrounding communities. A Few Signs that You Probably Have TMJ Disorder Some types of aches and pains can be immediately traced to a single cause that your dentist can easily address. For instance, a toothache often indicates a cavity, which your dentist can restore with the help of a tooth-colored filling. Other types of discomfort, however, are more complex to diagnose despite their sometimes severe intensity. For example, patients in North Hollywood who experience aches, pains, decreased function, and more in and around their jaws may not immediately realize that their discomfort is caused by TMJ disorder. When you open and close your jaws, your temporomandibular joints (TMJs) should allow your jaw to move smoothly. However, when TMJ disorder develops, the joints can’t move as smoothly as they should. This can often lead to your TMJs popping and/or clicking every time they move, which could become increasingly more painful the longer your TMJ disorder is left untreated. Another contributing reason to popping and clicking TMJs is the fact that some patients may have uneven jawbones or their TMJs may be out of alignment. This misalignment can force your jaw to move unevenly every time you bite and chew. Though you may not feel it, you may be able to see it by standing in front of a mirror and watching as you carefully open and close your jaw. When your jaw can’t operate or rest comfortably, your TMJs and jaw muscles can become overactive, especially at night. This results in chronic teeth-grinding – a condition known as bruxism – which may occur more frequently as you sleep and cannot control the movement. If your teeth are increasingly sensitive and you notice that their surfaces seem to be smoothing out, then you may be grinding your teeth as a result of TMJ disorder. If you exhibit these or any other signs of TMJ disorder, then seeking treatment as soon as possible could help you alleviate the discomfort and dysfunction resulting from it. For more information, schedule a consultation by calling Modern Smile in North Hollywood, CA, today at 818-763-9353. We also proudly serve patients who live in Burbank, Toluca Lake, and all surrounding communities. What Causes TMJ Disorder in the First Place? Patients who suffer chronic jaw pain, headaches, earaches, and more can often attribute their symptoms to some form of TMJ disorder. 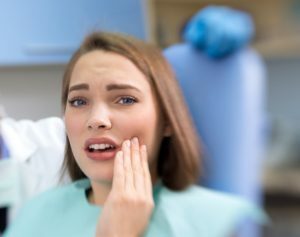 The dysfunction, which is named after the two large joints that control your jaw movement (TMJs), can lead to a host of symptoms that differ from patient to patient. Many such symptoms may not even seem directly related to your dental health. To alleviate them, your dentist can address your TMJ disorder with a customized treatment plan, which will be based off of whatever is causing your TMJ disorder in the first place. The main function of your temporomandibular joints (TMJs) is to allow your lower jaw to open and close properly whenever you bite, chew, and speak. If your bite isn’t aligned correctly (i.e., your teeth are crooked or your jawbone is asymmetrical), then your TMJs won’t be able to move as smoothly as they’re meant to. The undue pressure can damage your jaw joints and lead to the development of TMJ disorder. There are many different manifestations of excessive stress, and constantly tensed-up muscles is one of the more common ones. When you constantly tense your jaw muscles and clench or grind your teeth (a condition known as bruxism), the tension can gradually wear down, damage, or push your TMJs out of alignment. Arthritis, especially inflammatory (rheumatoid) forms of it, may affect one or both of your TMJs. Even if your bite is balanced and you aren’t particularly over-stressed, the presence of arthritis can be a direct cause of TMJ disorder and the long list of symptoms that accompany it. TMJ disorder can develop for a number of different reasons. To find relief from yours, your dentist will first have to diagnose the underlying issue. For more information, schedule a consultation by calling Modern Smile in North Hollywood, CA, today at 818-763-9353. You can find a home remedy for almost anything these days, and sometimes, you can find good advice. For instance, there are a few ways in which you can relieve the jaw pain and other symptoms resulting from TMJ disorder. However, like any other dental health issue, the pain will return eventually, even after the most effective home remedies. That’s because the underlying cause of the pain still exists. 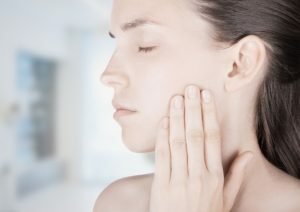 If you experience TMJ disorder, you may be able to mitigate your discomfort with these few tips, though we advise scheduling a dental appointment as soon as possible to address your jaw dysfunction. Relax your jaw joints and muscles – While there are many different causes of TMJ disorder, most forms of it involve overly tense muscles and joints in your jaw. Try to relax them by gently massaging each side of your jaw with the tips of your fingers. Avoid grinding your teeth – If you have TMJ disorder, then you may also suffer from bruxism, or chronic teeth-grinding. Try to pay attention and catch yourself if you unconsciously start grinding your teeth to avoid putting even more pressure on your aching TMJs. Wear your oral appliance – If you’ve already been diagnosed with TMJ disorder, then you may have already been prescribed with a nighttime oral appliance to help your jaws rest more comfortably. If you experience jaw pain during the day, then try wearing the appliance for a while to help alleviate it. The pain resulting from TMJ disorder might be temporarily relieved with these or other home remedies, but the only way to cure it for good is with customized treatment for the dysfunction. To learn more, schedule a consultation by calling Modern Smile in North Hollywood, CA, today at 818-763-9353. We also proudly serve patients who live in Burbank, Toluca Lake, and all surrounding communities.